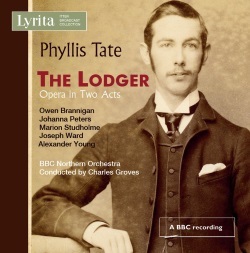 With so little of Phyllis Tate’s music being available on disc this transfer from Richard Itter’s private collection of off-air tape recordings is all the more welcome. The only other music by her that I know is the suite London Fields (Lyrita SRCD.214 also ASV CDWHL2138). The story is based on a novel by Marie Belloc-Lowndes which takes the events of the Whitechapel Murders of 1888 as its impetus. The Buntings are a couple of near destitute householders who take in a lodger; his name is never learnt. It recounts how Emma, the wife, comes to fear that their new house guest is ‘Jack the Ripper’ himself. The tension in the music is heightened as the opera, and Emma’s suspicions develop. These fears are further strengthened with the return of Daisy, the couple’s daughter, with Emma trying hard never to leave her daughter alone in the house with the lodger. In Act II Emma’s fear of the lodger turns more to pity, this is best seen in the Act II Scene II duet between her and the lodger, in which she pleads with him to seek help from a doctor before the police capture him and hang him. This pity turns into sorrow by the end of the opera. Tate ramps up the tension well as the realisation of the lodger’s true identity dawns and develops. This is tempered well with the pity that Emma eventually feels for him. There are parts which feel a little out of place. For example when we first encounter the chorus of Cockneys it sounds more like a number from ‘Mary Poppins’ than a part of this dark drama. The same happens in the final scene when the chorus returns singing “The Ripper hasn’t carved up any more …”. That being said, Tate does integrate this well into the opera. The music is very melodic for an work composed in 1960. It is a very wordy opera, with the dialogue driving the drama. This is helped by Tate’s compositional style. You hardly need the libretto, as the language is aided by the music, with the story being sung throughout except for the use of a narrator who occasionally sets the scene. The diction of all involved is excellent which is needed in an opera like this. The singers are wonderful throughout, with Johanna Peters deserving special notice as she quite effortlessly portrays the tension in her role as well as the pity. The production is very much of the 1960s. A modern version might sound quite different, and this for me makes this recording all the more valuable. The playing of the BBC Northern Orchestra, now the BBC Philharmonic, under one of the finest conductors of British music, Charles Groves, is also excellent. The documentation for this release is in the form of two booklets, one containing the full libretto, the other containing a detailed and very informative essay by Paul Conway, which gives excellent information about Phyllis Tate and her music.